In 1961, the Pakut-shipu Innu settled in Unaman-shipu. They left in 1963 to return to Pakut-shipu, which means “the river with sandbanks”. This community is located on the western shore of the Saint-Augustin River, 550 km North-East of Sept-Îles. It is accessible only by plane or boat. The local economy is based chiefly on arts and handicrafts, fishing as well as a small degree of tourism. Three community businesses are located on this territory, namely, a convenience store, hotel accommodations, and the radio station. 5:50 min. - On August 1961, Indian Affairs, unable to control the nomadic Indians, forced the Pakut-shipu band to move to Unaman-shipu. They forced them onto a ship, the “North Pioneer”. They promised them houses. Charles Mark - On August 16, 1961, the Department of Indian Affairs, unable to control the nomadic Indians, forced the Pakut-shipu band to move to Unaman-shipu. They forced them onto a ship, the North Pioneer. They promised them houses. On April 3, 1963, following Indian Affairs' failure to respect their promise to build houses, we decided to return to Pakut-shipu. The captain's name was Shimun Mestenapeo. The Innu lived here on the point near the island, and there were almost no Whites. 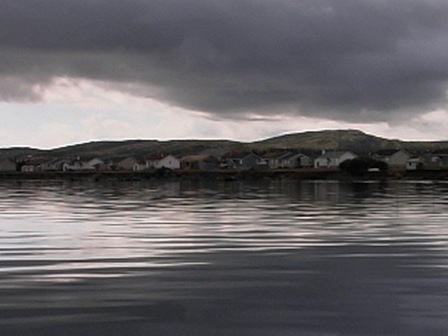 In 1977, bureaucrats from Sept-Iles decided to relocate us to the other side of the river. The government built houses and we were satisfied. But they didn't build a school, they renovated the old school on the other side of the river. In winter, the schoolchildren crossed the ice on skidoos and crossed by canoe in summer. It was very dangerous. Ultimately, because of our insistence, we obtained a school. The English lived along the coast here, some of them came from Newfoundland. They built their own houses. Times have changed. Young people go less and less into the bush. But I'd like to bring them back there. It would help the ones with learning difficulties. Ce vidéo est très intéressant. C'est un peuple très fier et attaché à son territoire et il a su le démontrer à ceux qui voulaient les déménager de force dans un autre territoire. Le narrateur déplore le fait que les jeunes vont très peu en forêt comme jadis leurs ainés car cela aiderait pourrait contribuer à aider certains jeunes qui éprouvent des difficultés d'apprentissage. Belle decouverte de mon territoire. Ce serait intéressant d avoir la traduction en français.